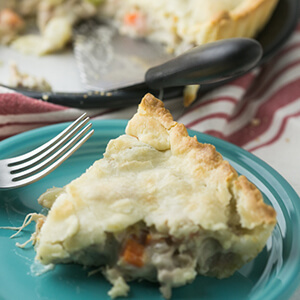 This classic chicken pot pie is exceedingly simple but totally from scratch. It is the perfect cool weather comfort food! Scroll down for video. Who doesn’t love the comfort of a classic chicken pot pie? When I was a kid, my mom’s homemade chicken pot pie with a biscuity-type topping was one of my favorite things that she made. I also really, really loved the frozen Swanson chicken pot pies that had about 1 million calories apiece. For several years I made it with refrigerated pie crust, Veg-All, canned chicken, and cream of chicken soup. I tell you, for a college student, that’s good eating. These days, of course, my classic chicken pot pie is a little more involved…but still pretty dang easy and always crazy comforting. I love to make a little creamy chicken and white wine sauce, throw in whatever vegetables I have, and wrap this all up in cream cheese pie crust. Could it be more perfect for a cool fall day? Oh, and obviously, this chicken pot pie would also be perfect for your Thanksgiving turkey leftovers. Chicken Pot Pie-Better Than Frozen? Yes! Preheat the oven to 350?. Place the potatoes and carrots in a small sauce pan and cover with water. Bring to a boil and add a teaspoon of salt. Boil until cooked through then drain. Roll half of the pie crust out into a 10-12 inch circle and press into a 9-inch pie pan or a deep dish tart pan (my favorite way to make any pie these days). Place in the refrigerator until ready to fill. In a large skillet, melt the butter over medium heat. Place the onions and celery into the pan and cook until softened. Add the mushrooms and cook until softened. Sprinkle with the flour. Stir and cook for one minute. Add the white wine and stir. Cook until thickened. Add the chicken broth and the milk, half and half, or cream. Stir to combine and cook until thickened. Add the chicken and stir to combine. Salt and pepper to taste. Remove the bottom pie crust from the refrigerator and pour the chicken pot pie mixture in. Roll the top pie crust into a 10-12 inch circle and lay on top of the pie. Seal the edges and discard the excess. Cut 4 vents into the top crust. Bake for 25-30 minutes then, if desired, brown the top under the broiler. Remove the pie from the oven and allow to stand for 15-20 minutes before serving. If you prefer not to use the wine, just sub in chicken broth. From her book of handwritten retro recipe cards and clippings, my grandmother’s strawberry pie might be my favorite thing she made. It’s easy and so tasty! I know I’ve mentioned this before, but one of my most prized possessions is my grandmother’s recipe book. My grandmother is my top cooking inspiration and this early seventies style recipe book of hers is stuffed full of clippings and scribbled recipes, some that I remember and some that I don’t (like this easy pie that she made at Christmas. One of my favorite things that my grandmother made was strawberry pie. This pie doesn’t contain that goopy glaze that you buy in a bag at the grocery store. It’s cool, refreshing, and delicious, and it tastes just as good now as it did when my grandmother made it when I was a child. I remember that from time to time, she would buy a strawberry pie from Shoney’s instead of making it. I definitely preferred her homemade pies. I don’t remember if she ever bought this junk, but I remember going through a phase where I loved that icky red goopy “glaze” that you can buy at the grocery store next to the strawberries and the little sponge cake shells. Honestly, I don’t even know why you would bother with that when my grandmother’s strawberry pie is so simple. There are actually two versions of this pie in her recipe book. One is made with plain gelatin, the other with strawberry Jell-O. 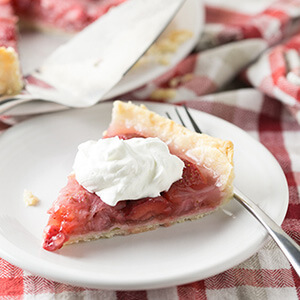 While there are definitely a few recipes on this earth that just beg for a packaged of processed Jell-O or pudding (hello, Watergate salad), I really don’t see any reason to make this strawberry pie with flavored gelatin. Fresh strawberries shine on their own, no need to “add” to their flavor. I love this pie plain or with whipped cream. I laughed that my grandmother’s recipe calls for whipped cream, but she always used Cool Whip. Isn’t it funny how our grandmothers saw convenience foods as a wonderful timesaver and here I am doing everything the old-fashioned way? Full circle! This pie was amazing. Is amazing….there’s still half of it in my fridge! Place 3 cups of the berries in a bowl and toss with the powdered sugar. Allow to macerate for at least an hour. Crush the remaining berries with a potato masher, fork, etc. Dissolve the gelatin in 1/4 cup cool water. Bring the cup of crushed strawberries to a boil with the remaining cup of water in a small pan; boil for two minutes. Stir the cornstarch and sugar together and add to the berries. Cook and stir until the mixture is clear. Stir in the gelatin until dissolved. Arrange the macerated berries in the cooled pie crust. Pour the boiled berry mixture over the strawberries. Chill for at least 12 hours. The prep time includes inactive time to macerate the berries. Who doesn’t love a delicious pie? With a cookie crust, a custard filling, and a cream topping, this amaretto pie is perfect for holidays or every day! Once, years ago, I posted a question on Facebook: if you had to choose, what would you say is the “official” cake of Tennessee? This question arose after I was surprised to see that some random cake (apple stack cake?) was the cake representing Tennessee in Warren Brown’s book United Cakes of America. I was honestly expecting red velvet cake, which apparently originated in New York?!?! I definitely think of red velvet as a Southern cake. But this post is not about red velvet cake. Anyway, someone commented that the official cake of Tennessee was, in fact, pie. Hmmmmm. I liked that idea – pie has a homey feeling to it, like I could churn out a boxed cake without much effort but if I want pie, I have to put a little thought to it. It evokes thoughts of grandmothers and seasonal fruits. I do love a good pie, though pie crust still – after as many as I have made – can cause me to come within a tenth of an inch of a food tantrum. But I digress. I asked my readers not too long after to tell me their favorite pies. I don’t remember much about the answers – I’m sure that I got a sprinkling of cherry, apple, pecan, pumpkin, buttermilk, and egg custard. One answer stood out in my mind, though: amaretto pie. Apparently, this was a thing that was popular at Mount Vernon Restaurant, a place where, at the time, I had only eaten once – and I did not know about amaretto pie. I love an easy pie recipe, but took me a good long while to make an amaretto pie myself. My first amaretto pie was completely cream-based, stabilized with some gelatin. It was delicious, but, once I tried the amaretto pie at Mount Vernon, I realized that it was a pretty far cry from “the real thing”, which was custard-based. So…I adapted a Cook’s Illustrated recipe for coconut cream pie. It was perfect the first time, besides the fact that I needed a few more cookies for the crust (I opted to use Biscoff cookies rather than graham crackers for the crust). Now, I will point out….Mount Vernon used a real pastry crust. Feel free to do so; just pre-bake the crust. I just love the sweet and slightly spicy crunch of the Biscoff cookies. And forgive me for the sloppy slice – you know that’s how your pies turn out too! Keeping it real. Pies go hand in hand with Thanksgiving, for sure, but this amaretto pie might turn out to be your family’s favorite for Christmas – and the rest of the year – too. 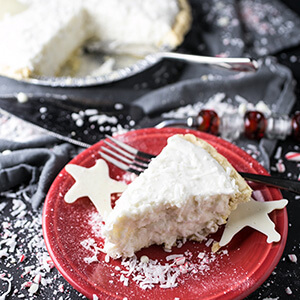 This recipe is adapted from a coconut cream pie recipe from The Cook's Illustrated Baking Book. Preheat the oven to 350 degrees. Process the cookies to crumbs using a food processor. Add the butter and sugar and process until well combined. If you do not have a food processor, place the cookies in a storage bag and crush using a rolling pin, then combine with the butter and the sugar in a bowl. Press the crumb mixture into a 9-inch pie plate, using a flat-bottomed dry measuring cup to press the mixture flat into the bottom and up the sides of the plate. Bake for 15 minutes then set aside to cool slightly. In a medium saucepan, whisk together the milk, amaretto, 1/4 cup sugar, and the salt. Set over medium heat. In a medium bowl, whisk together the egg yolks, remaining sugar, and cornstarch. When the milk mixture starts to simmer, slowly whisk 1 cup of the milk mixture into the egg yolk mixture, then add to the pan with the remaining milk mixture. Cook, stirring frequently, until thickened. Remove from the heat and stir in the butter and the almond extract. Pour into the cookie crust. Cover with plastic wrap, pressing the plastic wrap into the top of the custard, and refrigerate for at least 3 hours. When the pie has completely cooled, beat the cream, 1 1/2 tablespoons of sugar, 1 1/2 teaspoons amaretto, and 1/2 teaspoon almond extract using an electric mixer on medium-high heat until soft peaks form. 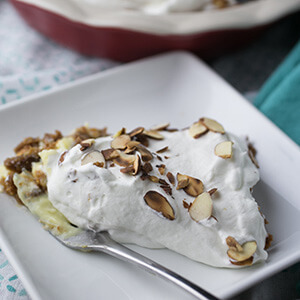 Spread over the top of the pie and sprinkle with desired amount of toasted almonds. Refrigerate until ready to serve. Prep time does not include time to chill the pie. To make parfaits, layer the custard and cookie crumbs into 8 small cups and top with whipped cream and almonds. Think of all things summery and you have blueberry pineapple pie – complete with a buttery coconut crumb topping, it’s summer at its best! As a writer and recipe developer, I find that my inspiration ebbs and flows. At times, my brain – and subsequently, my One Note app – overflows with ideas. I’ll be forced to pull up the app during church to make a note, lest I forget (don’t worry, I’m quick). Other times, my inner recipe cache feels so empty that I am certain I could cry. Writing a grocery list becomes a chore when I am not sure that there is anything going in to my cart that could become a blog post. I am driven even closer to tears when I think about the fact that I am not working right now. Summer break, job duties few and far between, full-time blogger. I should be brimming with energy, making new recipes left and right and getting ahead on posts so that the first month of school is easy breezy. However, this is not the case. In fact, I think that the pressure I put on myself to perform contributes to the dam that seems to form anytime I think about what to cook. Luckily, I still have that trusty One Note app. Here in late June, it’s helpful to have recipes brimming with blueberries tucked away, ready to be pulled out when the blueberry bushes are heavy with fruit (or, in my case, when the birds have had their fill of the fresh blueberries and I have to buy my blueberries elsewhere). This blueberry pineapple pie is one of those recipes. Months ago (winter break, perhaps), Philip and I watched a documentary on the PBS app called A Few Good Pie Places, highlighting bakeries around the nation with notable pies. One of the featured bakeries, A la Mode Pies, is known for their Blue Hawaiian pie. The pie is a blueberry pineapple pie with a coconut crumb topping. I guess you guys can see where the inspiration for this pie comes from? As I researched “blue Hawaiian” pies online, the only recipes I came up with were creamy, pudding based pies…definitely not what I was looking for. My own blueberry pie, adapted from The Cook’s Illustrated Baking Book (<–affiliate link), though, turned out to be the perfect starting place for this blueberry pineapple pie. I subbed in chopped pineapple for half of the blueberries and used a coconut crumble topping instead of making a lattice out of pie crust. The results were nothing short of perfect, especially since I used my deep-dish tart pan (<–affiliate link), which makes cutting the pie so much easier than using a pie plate. Topped with a little whipped cream, this blueberry pineapple pie with coconut crumb topping is a taste of summer! For other great recipes, check out the Weekend Potluck link-up on The Country Cook! The pie was adapted from The Cook's Illustrated Baking Book and the crumble is from Martha Stewart . Make the coconut crumb topping: whisk together the flour and 1/8 teaspoon of salt. In a food processor, pulse the coconut until finely ground. Add the butter and brown sugar and pulse until combined. Add the flour mixture and pulse until the mixture forms clumps. Set aside. Roll the pie dough into a 12-inch circle on a floured surface. Press into a 9-inch pie pan or deep dish tart pan, trimming and crimping the edges. Refrigerate for at least 30 minutes-until you are ready to use it. Preheat oven to 400 degrees. Place 1 1/2 cups each of the berries and the pineapple into a medium pan set over medium heat. Mash several times with a potato masher to release the juices. Cook the berries and the pineapple, stirring frequently, for about 8 minutes, until reduced to about 1 ½ cups. While you are cooking the berries and pineapple, place the grated apple into a clean dishtowel or several layers of cheesecloth and squeeze tightly several times to drain away as much of the liquid as you can. Combine the cooked berries/pineapple, apple, uncooked berries, sugar, tapioca, lemon zest and juice, and salt in a large bowl. Pour into the prepared pie crust and top with the coconut crumb topping. Place on a baking sheet to catch anything that might run out. Bake the pie for 25 minutes then rotate the pan and reduce the temperature to 350 degrees. Bake for 35-50 minutes longer until the crust is brown and the pie filling is bubbly. Cool for at least 4 hours at room temperature before serving.